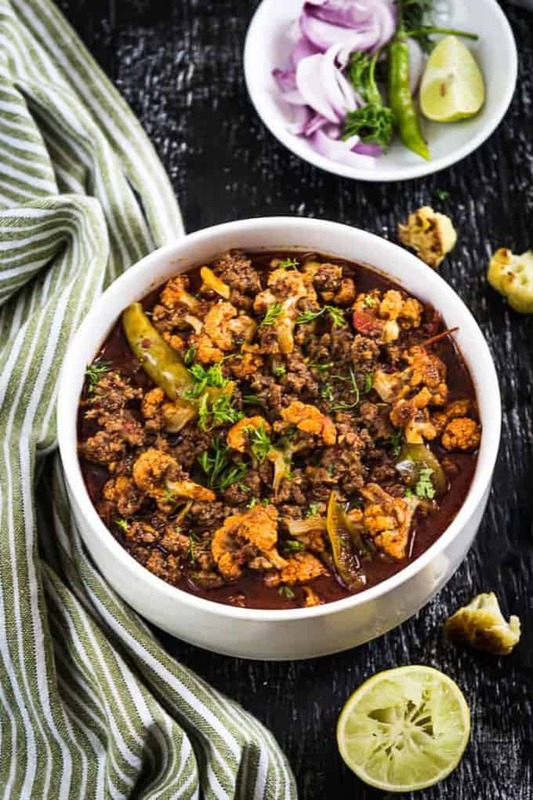 Gobi Keema or cauliflower Keema is a non vegetarian dish that can be prepared for any time of the da. It is prepared using cauliflower and mutton mince. Here is how to make it. 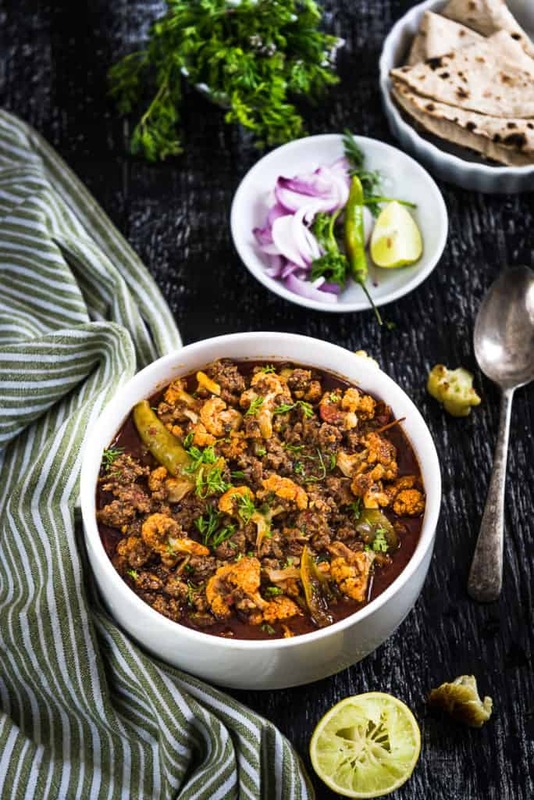 Gobi Keema or Minced lamb cooked with Cauliflower florets is a versatile dish that can be prepared for breakfast to be had in sandwiches, as an appetizer, during meals with rotis or naan, or as a great option for kid’s lunchbox. It is always thought that lamb imbibes the different Indian spices very well, enhancing the taste and flavor. It will therefore, surprise you because Gobhi Keema dish tastes as great as it looks. With the best of cauliflowers in the market these days, this dish should be a must make during winters. Cauliflower is a versatile veggie and I have used it in a variety of ways; to make dry appetizers such as Beer Battered Cauliflower Florets, mixed into Indian flatbread or Gobi Ka Paratha and in pickles like Gajar, Gobi Aur Shalgam Ka Aachar. As my Dad prepares delicious Methi Keema, I thought why not experiment a little and make something scrumptious using Gobhi as well. And then it took me no time to come up with the recipe of Gobhi Keema. 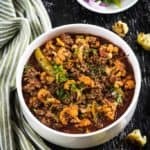 During those family feasts, Gobi Keema or Cauliflower Keema is that one dish which you could serve and it goes without a doubt that your loved ones would develop a liking for it. Make sure to take a note of its recipe, I have the same with you all and if you like it, you can share it with your friends and relatives as well, okay? Gobi Keema or cauliflower Keema is a non vegetarian dish that can be prepared for any time of the da. It is prepared using cauliflower and mutton mince. Here is how to make Gobi Keema. Deep fry the gobi florets until browned. Add onion and fry till pink in clot. Add ginger and garlic and fry till onions are golden brown. Add green chillies, salt and ground masala and fry for a few seconds. Add keema and fry on high heat for 3-4 minutes. Add tomato and a cup of water and cover and cook on low heat until keema is cooked. Add fried cauliflower, lemon juice and coriander and cook for 3-4 minutes. Serve hot with phulke or Naan.